Customers can avail from us a comprehensive assortment of High Pressure Bellows. Our range is manufactured by expert professionals using quality tested raw material, which is at par with the international quality standards. Two bellow elements are jointed together by a center tube and fitted with either pipe ends or flanges. The assembly is capable of both axial and lateral movements but because of center tube instability, is limited to low pressure applications. Two bellows connected by a common connector or centre piece, is called Universal expansion joint. These are used to absorb large amount of lateral deflections. In addition to this, Universal expansion joints can also compensate other two types of movements viz. axial and angular. 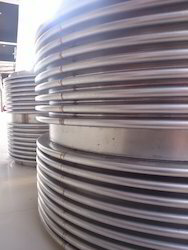 Double expansion joint is different from Universal expansion joint. 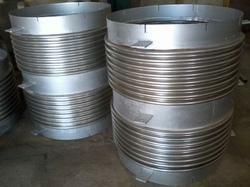 This type of Expansion joints is used to thermal movement absorption in multi plane direction of piping.